Garden Tool BoxNewsGardenWater FeatureUsing Water to Make your Garden Beautiful; Water Features! Using Water to Make your Garden Beautiful; Water Features! There is something so right about the sound of trickling water in an otherwise peaceful garden. It compliments the sound of birdsong and it adds a new dimension to a space thanks to light play and water(pond plants), creating a pretty and natural element. The sound of just one simple small water feature is reminiscent of natural water features and how many of us are lucky enough to boast a pond or stream in our garden? Not many that’s for sure! It’s a wonderful thing that promotes wildlife and attracts birds to your garden. Garden care will always pay off. 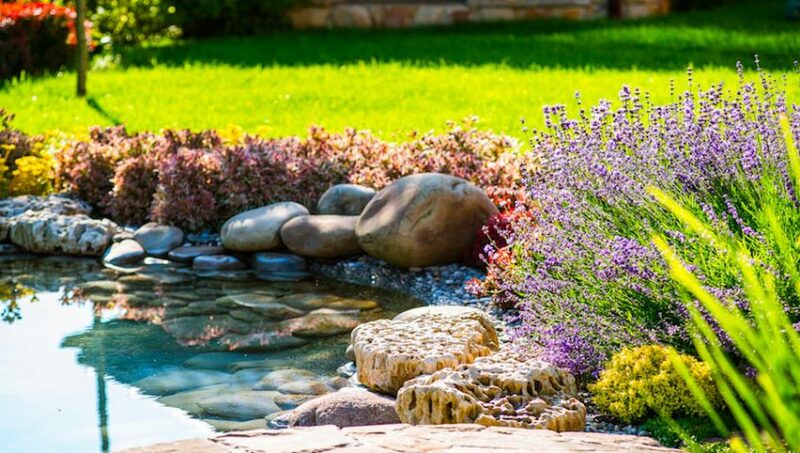 Water features for your garden are much less of an outlay financially than they were in the past; low energy water pumps and a proliferation of recycling ideas have ensured that more and more people are taking the plunge and adding water features to their gardens. It doesn’t have to cost a lot either, you can make a frugally priced garden water feature. So, how do we go about adding this wonderful water dimension to our gardens? Read on to find out! 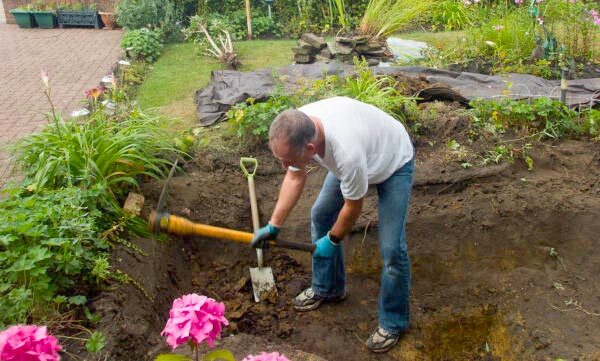 But before we do, notice that all you really required to dig your water feature is a pick axe and spade but here’s a list of the best gardening tools that will help. If you’ve decided that you want a water feature then your next step is to comb through the many landscaping options and choose which one is right for your needs. Even urban balconies and tiny courtyards can benefit from small features and they don’t need to cost the earth when it comes to installation and it’ll really improve the appeal of your home. If you’d like something with minimal maintenance that you can switch on and off as you choose, then a small trickle feature could be right up your street. For a project like this, it is usual to buy a water pump without a fountain head. This means that your water will trickle and not cascade, which is ideal for smaller spaces as you can enjoy the sound of the water as it flows and the play of the light on it throughout the day. Pumps, such as you would need for a trickle feature, work well in a series of upturned terracotta pots placed on a paved area; equally attractive is a large urn or even vase. Use large pebbles to add interest and to help disguise the head of the pump. 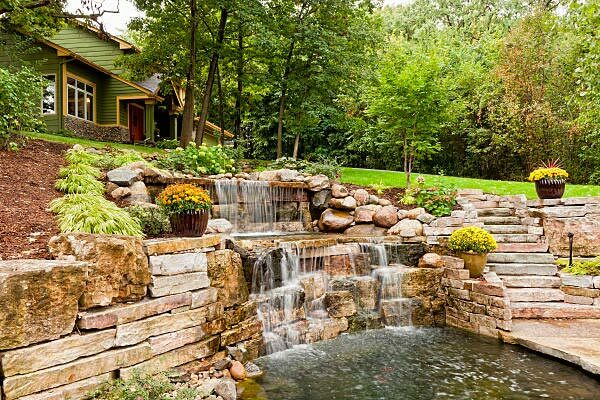 For pond based water features there is slightly more scope; what’s a pond without a water feature? 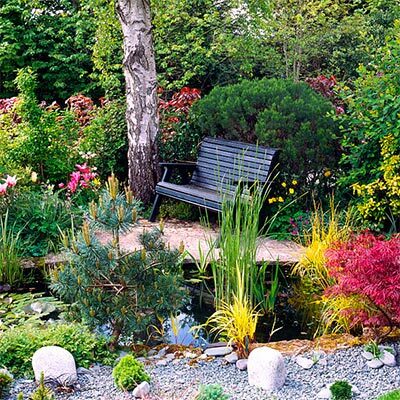 Water features for ponds serve more than one purpose; they not only look and sound great but they improve the health of your pond life by adding oxygen to the water which is great for plants and wildlife. Some might not see it as a benefit but its the right environment for snakes. You can choose fountains, cascades or sprays; they all look wonderful in a pond which is already teeming with life. 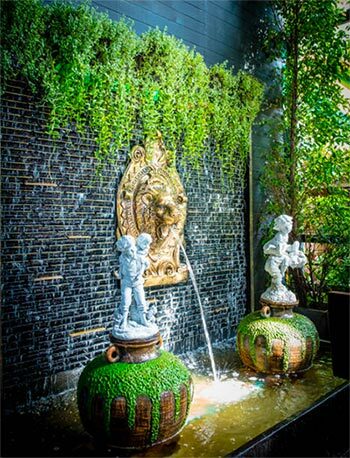 For a prettier look to your feature, go for a fountain/feature/waterfall pump. These usually come complete with a filter to ensure than small debris doesn’t block the water flow. Always use the size of hose which your packaging recommends; trying to squeeze a larger or smaller hose into your pump will affect the flow. When submerging pumps in ponds, place a brick at the bottom of the pond to assist with access when you need to maintain it. Water features should be installed by someone who has some knowledge of electrical fittings and if you are unsure, seek professional advice. If you want to go down the route of a more natural water feature that will attract a good amount of wildlife, especially in a drought – a garden pond is always an option! Here’s some quick tips on how to create one. Even a small wildlife pond can add a beautiful element to your garden. They are especially attractive to some because they require no pumps or fittings and they promote and assist wildlife. You may soon find you have a garden full of frogs and newts! A wildlife pond should be shallow (no more than 30cm at its deepest point) and it should also have sloping sides; this is to ensure that creatures may access if easily. Never use tap water for your wildlife pond, only rainwater is suitable and if you are patient, your pond will soon fill up! A liner is a must and will probably be your only outlay; apart from some pond plants which may be picked up very cheaply online. There is no need to add anything to the base of a wildlife pond, except perhaps some clean child’s play sand. This has no chemicals in it at all and will serve to give a more natural appearance. By the first day, you will notice water flies begin to arrive and within a few more water beetles will set up home too; attracted by the flies! After beetles you will see the arrival of frogs and newts, that’s if you’re lucky. A wildlife pond is a never ending chain and once you begin it, you are free to enjoy the wonderful world which will grow within it. Remember: Any body of water within your garden needs to be seen as a hazard for children; even a few inches are a potential drowning risk and no child should ever be unaccompanied near to water. You must make sure you make the garden safe for toddlers. Otherwise, enjoy your water feature – whatever it may be!